YEREVAN (Azatutyun.am)–A leader of the Armenian Revolutionary Federation launched stinging verbal attacks on the government as his party began its parliamentary election campaign on Monday. 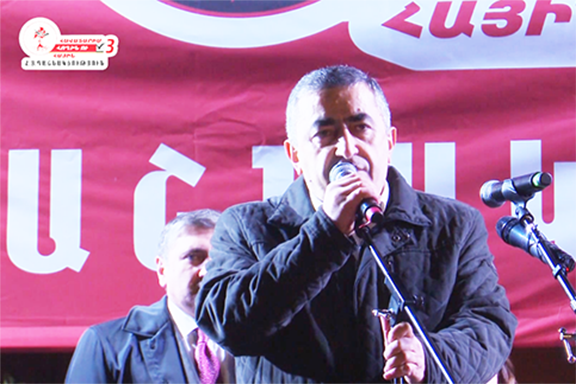 Armen Rustamyan said Prime Minister Nikol Pashinyan’s government may be trying to “replace old political and economic monopolies with new ones.” Rustamyan also claimed that Pashinyan is reluctant to limit sweeping prime-ministerial powers which he strongly criticized before coming to power in May. Pashinyan voiced the criticism during Armenia’s controversial transition from a presidential to parliamentary system of government initiated by former President Serzh Sarkisian. He said that constitutional changes will give the prime minister too many powers at the expense of the ruling cabinet. Rustamyan further claimed that those tycoons retain their “dominant positions” in lucrative sectors of the Armenian economy contrary to Pashinyan’s assurances that all economic monopolies in the country have been broken up. “It is claimed that there are no monopolies, probably because those monopolies are now showing their loyalty and are ready to serve the new authorities,” he said. The ARF was officially allied to Sarkisian during the last two years of his decade-long rule. A power-sharing agreement signed in 2016 gave it three ministerial posts in the former government. The ARF reached a similar deal with Pashinyan after mass protests led by him forced Sarkisian to resign as prime minister in April. The de facto coalition collapsed in October, with Pashinyan accusing the ARF and another partner, the Prosperous Armenia Party, of collaborating with Sarkisian’s Republican Party. The ARF holds seven seats in Armenia’s outgoing parliament. Analysts believe that its main objective in the December 9 snap elections is to win at least 5 percent of the vote needed for being represented in the new National Assembly. What a shame that the ARF never embraced the Pashinyan government because this was not ARF’s revolution. ARF only cares about the ARF and not the Armenian people. ARF is a very power hungry party. I wonder why Rustamyan was so quiet during Serjic and Robert times! Exactly! where the hell was Rustamyan then? I guess now it is easier to criticize than before, thanks to Pashinyan. They’re at least 8 months too late to criticize. The previous government was dissolved back around April. They’re no longer there to hear your cries. It is too bad for ARF to side with the criminals and thieves. This self sabotage is the beginning of the end of this organization. I’m happy the ARF dirt is finally coming out. Heevand Yegneeg ARF.